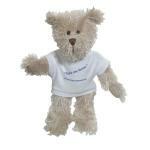 We have 100's of different ways for you to keep your business details and company logo promoted, and one of our most popular is to have your details printed unto the Advertising T-Shirt that the teddy bear is wearing. Our Rocky Bear with Advertising T-Shirt stand 10 inches tall and has jointed limbs for that real life effect. So keep your business details and comapny logo advertised upon our Rocky Bear with Advertising T-Shirt today! To find out more about our Rocky Bear with Advertising T-Shirt click here and fill in the contact form and we'll get straight back to you. Other promotional and personalised items besides our Rocky Bear with Advertising T-Shirt click here.